When it comes to bourbon (and pretty much all spirits), the treatment of the distilled liquids are just as important as how and with what the spirit is made up of in the first place. Buffalo Trace has been on the forefront of bourbon tinkering with their Experimental Collection. Since 2006 they’ve been releasing bottles with either various non-traditional mashes (rice, for instance) or strange treatments of reasonably normal mashes. The scale of this experimental work is huge. In 1987 Buffalo Trace Distillery began experimenting. Since then Buffalo Trace has produced over 1,500 experimental barrels of whiskey now aging in its warehouses. Each of the barrels has unique characteristics making each one different from all others. Some examples of these experiments include unique mash bills, types of wood, barrel toasts, and more. Buffalo Trace periodically bottles a few of these experimental barrels and makes them available to consumers. Each experiment that is released is very limited and rare. The two newest of these releases for 2013 utilize their Rye Bourbon Mash #2, found in Elmer T. Lee and Blanton’s. They take this same base and then give it two different, almost opposite, treatments. This bourbon is smooth. In fact, the treatment reduces the oak’s effect on the mash so much that it is actually too smooth. Despite a delicious sweet caramel flavor with just a bite of spicy rye on the finish, the body on this is way too light and you really miss the tannins from your normally charred barrel. This treatment goes so far towards rounding off the edges that it practically makes a circle. This makes for a great tasting, if not particularly complex, easy drinking bourbon. If bottles of this were $20-25, I would be all over it, but for something that costs $50+ for a 375ml bottle, I expect more. From your first whiff of this in the glass, you know exactly what you’re in for. The nose is huge OAK (think antique store) with an equally as significant booziness. 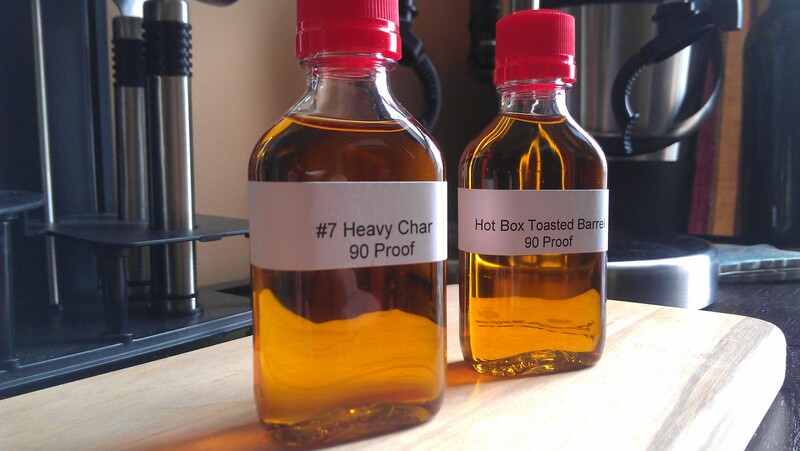 If the Hot Box Toasted drinks like something 80 proof, #7 Heavy Char smells and drinks like 100. You do get the expected fire and brimstone, with the accompanying level of tannins and extreme dryness. Despite this, I actually enjoyed my glass of this far more than I expected. I’m usually not a huge fan of bourbons on the dry side, but the spiciness of the rye really teamed well with the extended scorching of the barrel, which gives it an almost savoury flavor. I found that most of the vanilla and fruit stated in the tasting notes are covered by the taste of the oak. This bourbon definitely isn’t for anyone, but it is unique and if you like your bourbon expensive and in beast mode, you might give this a look. Verdict? While it was interesting to see what completely different treatments will do to the same mash, it’s tough to justify throwing down $50 or so on a 375ml bottle. Per volume, this price is equivalent with some of the best, most limited bourbons on the market, ones that are a considerably superior experience than these two. The problem is the Goldilocks effect: one of these treatments is too little and the other is too much. Give me this mash aged in a normal barrel for 15/16 years and I pretty much guarantee what comes out will be better than both of these. Samples were provided for review by Buffalo Trace Distillery. Keep it! It won’t hurt anything.